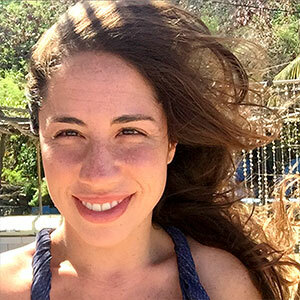 Of Brazilian and Israeli origin, Natasha Shprecher balances a high level of perseverance and discipline with kindness and a unique warmth. She graduated in Product Design in 2008 from FAAP University in São Paulo, and soon after put her entrepreneurial skills to practice. At 22, her first endeavor was a bakery that rescued old family recipes from Austria. For the next 8 years of her life, the bakery grew and made her grow, serving as an important learning experience, where she improved her communication, tolerance, management, and leadership skills. Her passion for team sports also fostered a sense of community. As a volleyball player, she learned teammates are responsible for one another and that mistakes will happen all the time. This taught her that the most important thing is to stay focused and ready to overcome the next move. More recently, working for 5 months as a volunteer at Schumacher College, Natasha got to further develop her sensibility and interpersonal habits, forming strong relationships and taking on an active role within the Schumacher community. This experience can be summed up as an experience of awareness and awakening, which made her more conscious of the fact that we are all connected and co-responsible for the planet and people’s state of mind.